Gifts made from the heart are always the gifts a mother cherishes the most. Paper crafts, cut-out cards, and hand-picked flowers are some of our favorite Mother’s Day gifts. Simple, easy and full of love. While these gifts may not always be the most expensive, the value is within the loving care it took to create them. But paper crafts and handmade cards aren’t the only gifts for Mom this Mother’s Day. This year, put down the scissors and glue sticks and instead make mom something she can use for years to come. A chalkboard flower box is a simple yet wonderful gift for Mother’s Day. Personalize it with a special message and give it to mom with a fresh plant inside. Gifts made from the heart are often the gifts a mother cherishes the most. All you’ll need for this simple gift is a small wooden box, chalkboard paint, and paintbrush! Gather your materials and cover your workspace with newspaper or an old tablecloth to prevent mishaps. First, take your chalkboard paint and read the directions. Yes, these directions matter! Chalkboard paint is different from regular paint and is not applied the same way. Pour paint into a shallow dish and start applying the first layer to every outside and inside surface of your flower box, except the bottom. Allow to dry and then apply your second layer of paint. 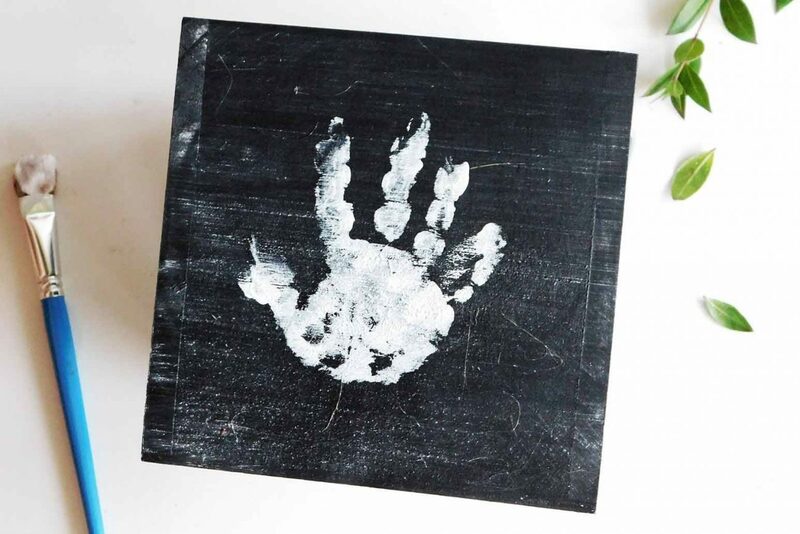 After the paint has completely dried, add a personalized touch by stamping a handprint to one side of the flower box. Simply do this by taking a contrasting color of paint, such as white, and lightly brush a thin layer of paint onto your child’s hand. Help them by holding their hand steady as they gently press their palm and fingers against one side of the box. Add your child’s name below and the year as a memento. Lastly, add a plant inside and give it to Mom with a special chalk message written on the box. A sweet gift for Mother’s Day, and something she can use for years to come! You’ll also like A Mother’s Day Gift Guide for Every Kind of Mom, Celebrating All of the Real Mother’s Days, You Don’t Have to Be Perfect to Be a Great Mom, This Kind of Love Is What Makes a Mother’s Legacy, and 5 Ways to Care for a Single Mom on Mother’s Day. Lydia is a former teacher who traded in textbooks and grading papers for the glamorous life of wife and mom. She blogs to show the raw, unedited and vulnerable experiences of marriage and motherhood to fellow wives and mothers. She writes about tips, tricks, and honest truths to help you cope with the daily chaos that accompanies us every step of the way.